Pat, I again want to thank you for helping me get my mule deer of a life time. I’ve been hunting for 30 years, and finally got the mule deer of my dreams, I’ll be back! I just wanted to thank you again for the wonderful adventure I had as a guest with Swan Mountain Outfitters. Your staff was excellent and the camp comfortable. I felt safe at all times. The food was tasty and plentiful. I not only had a great time but learned a great deal about everything from horses and mules to fishing, hunting and just plain sightseeing and relaxing. The trip was so perfect I cannot stop talking about it and have told many people about my experience and given out the name of your outfitter website. Also your hospitality at your home/guest cabin was wonderful as well. I was fortunate to participate in the last hunt of the year in November 2013 and enjoyed myself immensely. Your hospitality and attentiveness before, during and after the hunt was greatly appreciated. Swan Mountain Outfitters gave me the exact experience I was looking for and much more. This was the best hunting trip of my 30 years of hunting. Your most professional and caring staff was a pleasure to be around. The remuda of horses were more than fit for the purpose and impressively trained. My guide Mike, was an astounding professional with maturity and knowledge beyond his years. His work ethic and personal demeanor were very refreshing and speaks volumes about the folks you employ. I look forward to bringing my son for the same experience. Many thanks! The scenery was wonderful and the horses were in great condition. What really made your operation shine (and as a result, our experience) was our wrangler/guide Claire. She was a wonderful, engaging and knowledgeable host. Knew her stuff, answered all of our questions and even laughed at our jokes! If your business is your people, then you have a great business. As you know I have been coming back for over ten years, and I’m often asked why. It is simple, I know of no other place where I feel so away from it all. I love the terrain, the camps, staff and animals. I’ve been to other outfits, but none compare to the experience I’ve had at Swan Mountain Outfitters! I just wanted to thank you for providing an excellent hunting experience. The trip was exactly as you said it would be and no BS. I could not be happier with the entire trip from start to finish. You have a top notch staff that was professional and courteous the entire time. The food was great and plentiful. Give all your staff a pat on the back for their efforts. I will be a return client and will tell anyone who is thinking of taking a back country hunt about your operation. I went on the late season hunt with my 12 year old son and had an awesome time. It was a great hunt for my son’s first time on horseback; the stock, the meals, the guide, the lodging, all great. We took a whitetail buck on the first day and a 5 point bull on the second day, had a chance at a wolf but could not seal the deal. We were into elk and deer every day, but it doesn’t always go your way. This is a real hunt, wilderness area, you have to get out and hunt it hard but there is a lot of game and it pays off. We will be back when my son is a little older and we can head back into a spike camp. We both had a great time! We had a great time in Montana and certainly experienced many ‘firsts’ regarding the climate and horseback extremes (relative to our current experience levels), but that is all part of the challenge and adventure that we look back on and appreciate the opportunity of having. Your guides were top notch and very friendly, and your operation is nicely laid out and well executed. Thanks again for enabling this experience for us. My daughter and I had a great time on our recent 3 day pack trip! Shawn was wonderful with Mary Grace, who is an avid horse lover- We are definitely coming back to do the 5 day. Rick did a great job too. 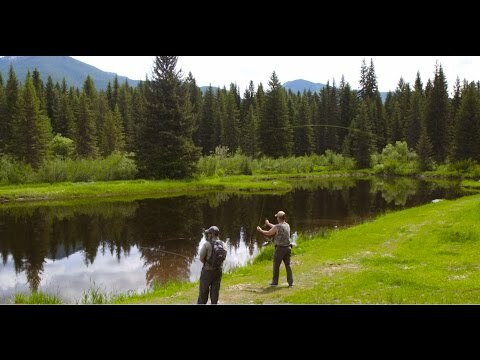 I really enjoyed my time with both the guys– great scenery, great fishing. Thank you! Just wanted to say what a great time we had at Swan Mountain Guest Ranch. Al and I loved the ski trails. The conditions were awesome and we couldn’t have been treated better. Plus, I got my pony fix! Thanks to Chuck for coffee and photos. I haven’t made copies yet, but I will this week. Already prepared a canvas for my Montana painting. I’ll return the photos as soon as I make copies. Thanks so much! I was fortunate enough to be given a lion hunt with Swan Mountain Outfitters as a Christmas gift from my wife and parents. It turned out to be one of the greatest gifts that could be given! Everyone was very helpful answering questions and helping with logistics before my arrival, and Pat and JoAnne were very welcoming hosts during my stay. The food was excellent! The guide/houndsman was top-flight; I really can't say enough good things about him. He was so good, in fact, that my entire hunt lasted only four hours, and a 150 lb tom was taken. 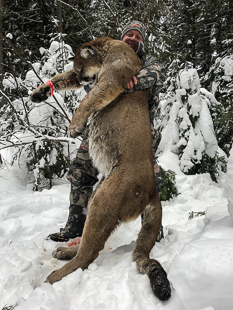 I have already recommended Swan Mountain Outfitters to friends and I plan to return in the next year or two with a family member for another lion hunt. My only recommendation to anyone considering a lion hunt, is to spend as much time as possible getting in shape. These aren't easy hunts, but the reward is worth the work! 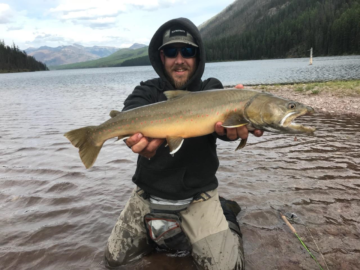 If you are lucky enough to book with Swan Mountain Outfitters, you won't be disappointed! I wanted you to know how fulfilling this trip was for me. Everything about it was outstanding, the facilities, my guide was the best, the horses, food, and oh yea, getting both an elk and a mule deer went way beyond my expectations! Thanks to Swan Mountain Outfitters for an awesome hunt. My guide, Tom, was very knowledgeable and pleasant to hunt with. The meals were prepared by Gini, WOW, the meals were incredible. The lodge was very clean and accommodating. Pat Tabor and his staff are top notch. I will plan another trip in the future. Thank you for the great experience. Just a quick note to thank you and everyone at SMO for our recent hunt. The hunting was great but the people were outstanding! Everyone I came in contact with from Martin, Jenni, Donnie, Katie, Chris and Shawn went out of their way to make you feel at home. I can’t complement Tom enough, what a great guide and person. I feel I have been spoiled having him as a guide on my first guided hunt! And of course all of this hospitality starts at the top with you and your wife, what great host’s. I am planning on coming back next year just have to figure out the logistics. I will be in touch shortly. Pat here is the long awaited cd with photos from our incredible summer trip. As we look at the pictures, we know it doesn’t do it justice. We still are talking about how incredible the trip was, we wish the two of you the best of luck. Once again I want to thank you for a wonderful and exciting hunt. It was a great experience and exceeded my expectations. I know I will reflect often on the beautiful country you shared with us and look forward to the day I can return for another hunt. 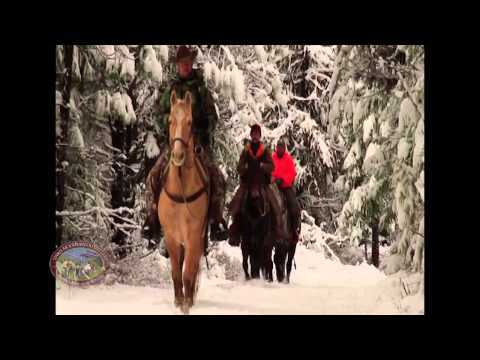 I absolutely loved Swan Mountain Outfitters and the experience I had with my son while hunting with your outfit. I can’t say enough positive things about your team, the food, the amazing setting, and the memories made. Tom (our guide), was one of the best parts of the whole experience. He was such a professional through the entire process. He was knowledgeable and very patient. He taught us a lot about the land, the plants, the animals, and honest hard work. I am very grateful to have had him as a part of our experience (and not just because he got us a huge buck). Words can’t express our appreciation for the job the two of you did on our family reunion. What an incredible venue Swan Mountain Ranch is. Hosting an event is one thing, but the arrangements you made for special meals, entertainment, etc. was over the top. We do this every five years, but this was by far the best reunion we have ever had. I want to thank you for the hunt through the Women on Target program this past November. It was a wonderful experience, just what I hoped for. Having Katie as the guide was perfect for this hunt. Thank you also for the information you sent on getting prepared, both physically and what to bring. Having that information and acting on it, helped this to be a successful experience.